We are changing the way you shop with 35 local vendors and thousands of treasures, all under one roof! At Southern Darlin's Boutique, you are greeted with a friendly smile and some good old fashion southern hospitality. Our classy little boutique is an emporium of treasures brought to you by local entrepreneurs. These creative Grand Lakers burn the midnight oil scouring the web for trendy styles and work tirelessly to create that perfect Lakehouse sign or exceptional piece of jewelry that you’ll immediately fall in love with. 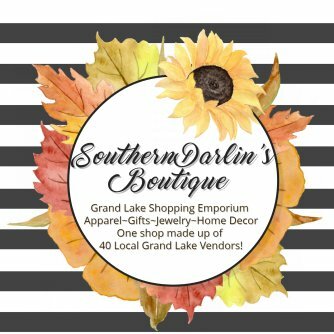 The Southern Darlins of Grand Lake are a family of vendors that work together as a team to bring to you handcrafted treasures, Grand Lake décor and apparel, and unique gifts items that you cannot find anywhere else. Our little shopping center provides an exclusive shopping experience, allowing you to shop at 35 completely different stores with completely different styles, all under one roof! Want to be cool this summer? Shopping local makes you cool as a cucumber! Fun Fact: A Civic Economics Study in Grand Rapids, Michigan found that when you spend $100 at any local business, roughly $68 will stay in our local economy. When our community grows, we all grow! Interested in being on the Team? We are a classy little vintage mall with a boutique feel and offer clean, freshly painted booths throughout the store that are perfectly sized for your unique creations! We welcome fun and exciting products that bring a vintage touch to our shop. When you rent booth space from Southern Darlin’s, you receive your own personal sales agent on site during shop hours with full marketing exposure that will showcase your products on all Southern Darlin’s Boutique online platforms.